Adya Clarity® is a dissolved ionic mineral salt. It is a magnetic sulfate mineral solution that is extracted through an acid sulfate process from one of the rarest, and most mineral rich Biotite or Black Mica sources on this planet. 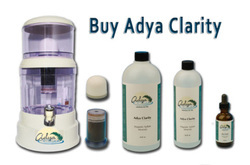 Adya Clarity’s® function is to precipitate dissolved contaminants within water making the toxins harmless. Adya Clarity® has the ability to convert dissolved contaminants into burned-up, inert matter. The result is great tasting water that is mineral rich, hydrating, and detoxifying. This honorable mineral salt is so powerful we have been able to provide 3rd world countries the ability to sanitize and purify some of the most contaminated water on this Earth. Adya Clarity® is formulated to be mixed into water. Once mixed with water, the minerals dissolve and become part of the water. Adya Clarity® minerals also work to purify the water. Dissolved contaminants which exist in the water become visible. They then sink to the bottom of the glass or container and never mix back into the water. In other words, while in this water, they can never dissolve again. In distilled water there should be no dissolved contaminants, therefore, there should be no precipitation. Unfortunately, almost all other waters such as tap, rivers, lakes, ponds, spring and even most bottled waters show signs of dissolved contaminants. 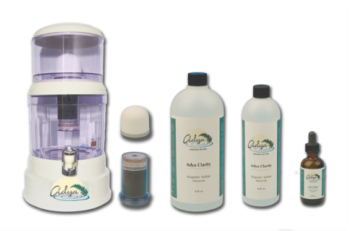 Adya clarity® is amazing at revealing contamination along with making the water safer, cleaner, and healthier to drink. In this way, Adya Clarity® is used to clean-up the impurities in water and as an outstanding source for a complete matrix of minerals. Add 1 teaspoon of Adya® to one gallon of purified water. Let it sit for 30 seconds after stirring in. If you are starting with regular tap water, you may need to add more Adya® depending on how contaminated the water is. You can also let the water sit over night. Keep it in an uncovered container. Depending on how many contaminants are in the water – there will be a gathering of agglutinated mucky substance at the bottom of the container often seen as a peachy color. The visible substance is inert and harmless and you can pour off the top of the container to avoid ingesting the agglutinated material. WHEN I ADD ADYA CLARITY™ TO MY WATER, WHY DOES MY WATER TURN CLOUDY? The cloudiness that instantly occurs when you add Adya Clarity® to your water is actually the precipitation of the contaminants that had existed in your water. Through the power of the minerals, those elements that were dissolved in your water have become undissolved. The powerful magnetic forces of Adya Clarity’s® minerals have attracted contaminants and clumped them into visible particles that can now fall out of solution. These clumps of contaminants are heavier than water and are now free to become sediment. The contaminants are rendered harmless. Adya Clarity® allows the water molecule clusters to reduce by half their size. As a smaller water cluster, the contaminants have less space upon which to attach themselves to the water. The contaminants are forced to fall out of solution. Furthermore, the precipitated contaminants will never dissolve back into the water. Amazing, but you can see the water become pure right before your eyes! CAN YOU DESCRIBE THE ADYA CLARITY™ CLEAN-UP PROCESS IN MORE DETAIL? Our product demonstrates the different functions of minerals in water. As can be observed in Nature, minerals clean up our Earth and fortify our eco-systems. - Add the minerals to the water and instantly, a process begins in which oxygen in the water is changed into Activated Oxygen. - Activated Oxygen burns up ”invisible” contaminants and makes them into “visible” and “water insoluble” contaminants. This process is called Deposition. - The contaminants that were invisible are made visible. - The contaminants which have been made visible through the deposition process now go through another process – agglutination. - Agglutination is the gathering up of the contaminants. Once again, this occurs because of the minerals. The minerals in Adya Clarity™ absorb and unite the contaminants through an electron ion function. The magnetic nature of the minerals causes the contaminants from the deposition process to gather up and grow in mass. - The ionic charge within the minerals forces the cluster of the water molecule to be reduced by half, and the contaminants fall out of solution. - Another process occurring within the water is the optimization of minerals. For this process we can use an analogy of relationships. Minerals are either combined into strong or weak relationships. When minerals are in weak relationships, they are easily broken up. But when minerals are in strong relationships, they remain together. - Adya Clarity® minerals are in sulfate ionic form. This is a very strong relationship for minerals. - Sulfur when mixed with minerals creates amino acids in living organisms. When Adya Clarity® is added to water, it combines with minerals that are in the water to force the breakup of weak mineral relationships. - For example, if sodium fluoride is present in water, the Adya Clarity™ minerals will rearrange the molecules into calcium fluoride. Calcium fluoride naturally occurs in the Earth’s waterways. - Likewise, the water now contains an amazing full spectrum of over 80 trace minerals. WHY DOES ADYA CLARITY™ IMPROVE THE TASTE OF MY WATER? It has been well know in the water industry that enhancing water with minerals enhances taste. Like all good water that has the best minerals, Adya Clarity® water tastes great. Adya® minerals also ensure activated oxygen in the water. Our customers also find that when they combine their reverse osmosis or highly filtered water with Adya Clarity® and then run their water through our filtration system, the water is more balanced and tastes refreshing. WHY IS ADYA CLARITY™ SO POWERFUL? Adya Clarity® is sourced from Mica. In nature, Mica is required for two things: to clean-up our Earth of toxins and to restore the Earth to balance. This process is happening continuously in our Oceans and fresh body's of water. In this way, Mica is the source of minerals for our waterways which makes Mica one of the most important resources for having clean water. Mica is also known to be the source of some of the best mineral formations such as zeolites, fulvic acid, ocean salt, etc. Adya Clarity® is sourced from one of the rarest forms of Black Mica. WHAT WILL ADYA CLARITY™ REMOVE FROM MY WATER? Some of these functions are best achieved when using with a gravity fed filtration system. This process removes particulates created from the separation process resulting from adding Adya Clarity® to water.